Here’s a piece I did with my dear friend Sandra Cuffe for this month’s Canadian Dimension magazine. Oil pipelines have been likened to a 21st century version of the railway: opening up new lands for state and corporate control in order to move valuable commodities that keep the economic motor of the nation running. Corporate publicity materials confirm the comparison: “We’re building Canada, bringing growth to the north,” reads an Enbridge brochure. The explosion of oil production in the Alberta tar sands has created a new push to build pipelines throughout North America. In northern British Columbia, most of which is unceded indigenous land, there are overlapping proposals for new ports and pipelines to transport tar sands oil. These come hand in hand with new proposals for mining mega projects, dams, roads, power lines, shale gas and other infrastructure that would crisscross important ecosystems through out the north.“They’re trying to justify the means of things like pipelines, not just pipelines in general, but raw logs, raw minerals, [and] unrefined mock oil from the tar sands,” Mel Bazil from the Wet’suwet’en and Gitxsan Nations told Canadian Dimension. Perhaps the most well known of the proposed projects is the Enbridge Northern Gateway Pipeline project, which consists of twin pipelines spanning the territories of 30 First Nations, for a total of 1,172 km. According to figures released by Enbridge, the total cost of the project is $5.5 billion. If completed, a pipeline measuring nearly a meter in diameter would transport 520,000 barrels of tar sands bitumen per day from just outside of Edmonton to the north coast of British Columbia. The other pipeline would be 50 cm wide, and would serve to push 193,000 barrels of condensate, a chemical substance used in the extraction of tar sands oil, in the opposite direction. The company also plans to build a port in the town of Kitimat that would see about 220 oil supertankers in and out per year. From the port at Kitimat, bitumen would be transported to Asia, opening up an important new market for the world’s dirtiest fossil fuel. The pathway of the proposed pipelines, which will be buried one meter underground, crosses hundreds of rivers and streams, including the headwaters of the Fraser and Skeena rivers. A leak, spill, or explosion would have devastating effects on numerous ecosystems spanning hundreds of kilometers all the way to the coast. “It’s not a question of whether there will be leaks,” said Gage, explaining that a failure or spill is a certainty at some point along such an extensive pipeline. “There’s a debate about how frequently these spills would occur. The recovery rate would be a very small percentage of the oil. We’ve seen Enbridge having trouble cleaning up the impact of that spill in Michigan,” he added, emphasizing that the affected regions in that case were much more accessible for clean-up crews than many areas along the proposed path of the Northern Gateway pipeline. Enbridge is no stranger to such happenings along the 15,280 kilometers of pipelines they operate in North America. In 2010, a leak along one of their pipelines in Michigan resulted in millions of barrels of crude oil being spilled into the Kalamazoo River. This spill, coming after the BP disaster in the Gulf of Mexico, garnered Enbridge negative attention, and was followed by a second spill outside of Chicago. The Northern Gateway project is currently before the Federal Joint Review Panel (JRP), which is a three member panel: two representatives named by the National Energy Board, and a third by the Federal Minister of the Environment. The NEB representatives are tasked with determining whether or not the project is in the “national interest,” while the representative from the Ministry of the Environment must decide if it will have significant adverse impacts on the environment. “The duty to consult is there, by the governments, but it’s being manipulated,” said Russell Diabo of Kahnawake. Diabo is a First Nations policy analyst and editor of the First Nations Strategic Bulletin. But opponents of the project claim that Enbridge and the Canadian government are employing consultation in order to push the project ahead. The JRP process allows for “reasonable accommodation” of feedback from “stakeholders.” First Nations and other communities along the path of the proposed pipelines are slotted into the category of “stakeholders,” instead of being considered the rightful owners of the land. Though there have been some recent successes for indigenous communities fighting the extractive industries in BC at the JRP level, including the cancellation of the proposed Kemess North copper and gold mining project in Tse Keh Nay and Gitxsan territories, and more recently the Prosperity Mine in Tsilqot’in Territory, there is no doubt that environmental regulations at the federal level are lax. If the JRP proceeds according to the timeline currently set out, there should be a decision about the pipeline by the end of 2012. 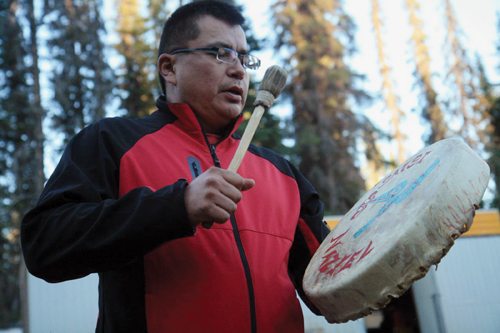 To date, no First Nation has publicly stated their support for the Northern Gateway, despite company assertions that there are First Nations and community members that support the project. Though some indigenous and environmental organizations have registered as participants in the process in order to voice their concerns and, in some cases, their complete opposition to the pipeline. Some of the participating First Nations have made statements clarifying that participation in the JRP and in protocol agreements in no way signifies support for the project. “Enbridge has pointed to 30 ‘protocol agreements’ signed with indigenous nations and claims support for their pipelines. In fact, Enbridge’s public documents show that these agreements do not indicate support but simply ‘establish the ground rules and points of contact for discussion on all aspects of the Northern Gateway project that might affect or involve First Nations and Metis communities,’” clarified Xaxli’p Chief Art Adolph of the St’at’imc Nation, in a December press release by the Yinka Dene Alliance. Many more First Nations are actively engaged in grassroots resistance to the Northern Gateway and refuse to participate in the Joint Review process or dialogue with Enbridge. Members of the Wet’suwet’en nation have already issued a trespass notice to Enbridge officials, and held an action camp against the pipelines last summer. “It’s non community members telling community members how they see the production happening,” said Bazil of the JRP. He says Enbridge and other corporate interests take a fragmented approach to the construction of pipelines and other infrastructure which ignores the cumulative impacts on the land. The vast majority of British Columbia’s lands and resources belong to the First Nations that ceded neither territory nor sovereignty through treaties or agreements with governments. “There will be no proposed pipelines coming into Wet’suwet’en territory,” said Toghestiy, a hereditary chief from the Wet’suwet’en nation, during a presentation at the Everyone’s Downstream Conference in Edmonton in November. “Our laws never died. Our governance system has never died,” he said. On December 2nd, 61 First Nations published their Save the Fraser Gathering of Nations Declaration as a full page ad in the Globe and Mail. “This project which would link the tar sands to Asia through our territories and the headwaters of this great [Fraser] river, and the federal process to approve it, violate our laws, traditions, values and our inherent rights as indigenous peoples under international law,” reads the Declaration. “We will not allow the proposed Enbridge Northern Gateway Pipelines, or similar Tar Sands projects, to cross our lands, territories and watersheds, or the ocean migration routes of Fraser River salmon,” it continues. The publication of the Declaration prompted a swift response from Enbridge. “The Northern Gateway team wants to assure you that these people do not speak for everybody. There are a great many people, including First Nations and community members along the proposed route, who understand that this project can be built and operated safely. These are the same people who support the project,” Enbridge countered in a press release that came out the following day. In another blow to Enbridge’s attempt to convince Canadians that indigenous peoples support the Northern Gateway pipeline, five First Nations of the Yinka Dene Alliance turned down what they say was an offer from the company to turn them into shareholders in the project. Enbridge went into damage control, claiming that they had never made such an offer to the Yinka Dene Alliance, but the company was again unable to name a single First Nation that has declared its support for the proposed Northern Gateway pipeline. The voices of indigenous peoples and their allies fighting new oil pipelines and tanker traffic have been reinforced by recent actions on the municipal and federal levels. On October 1, the Union of British Columbia Municipalities voted resoundingly against the Enbridge pipeline and tanker traffic up the coast. “Understanding of the issue is growing, and that is leading to stronger opposition across the province,” said Carol Kulesha, Mayor of the Village of Queen Charlotte, in a press release. In December, a motion forwarded by the New Democratic Party calling for a ban on new tanker traffic in BC was passed, garnering the support of all three opposition parties. Amidst the actions and declarations against the pipeline, executives from both the Canadian Pacific Railroad and the Canadian National Railway raised the possibility of a rail pipeline at a tar sands conference in Calgary. CN Rail already operates a program they call Pipeline On Rail. PipelineOnRail™ is an economically sound, surprisingly fast way to ship crude oil products within Alberta, to the rest of Canada, the US Midwest, the Gulf coast, and other export markets,” reads CN’s website. Dawn Paley is a Vancouver-based journalist. Sandra Cuffe is a contributing member of the Vancouver Media Co-op.